Shoot, score and have a ball at Stephanie’s Soccer Practice! Train with Stephanie for the big soccer game! Dribble the soccer ball through the cone obstacle then practice guarding the goal with the goal-shooting function! Practice hard then take a quick break on the bench and refuel with the water from the cooler and a banana. After some tough training, play fetch with Scarlett. Includes Stephanie mini-doll figure and her dog, Scarlett. Practice guarding the goal with the goal-shooting function! Kick the ball through the cone obstacle course! You know who I am; you know what this is. Welcome to my fifth review this year so far, and this time we’re tackling yet another Friends set. So far the third wave has produced some interesting sets for many of the Friends cast, including one for a whole new character. But as Stephanie makes her return, will the tide change? Well very interestingly she appears in one of the first sports-themed Friends sets (if you don’t include the equestrian sets in the second wave). There hasn’t been a sports-related set in a long time, so let’s see how this one goes. Stephanie’s Soccer Practice probably has the most colourful of box designs in the GBP 9.99 price range, but the variety in all of the sets – as well as the box designs themselves – make it difficult to pick one out of the four. I think most people will end up buying all four sets anyway. One thing that immediately came to mind when looking at the box art is that Stephanie herself isn’t playing soccer (football), despite being in sportswear: she’s coaching a puppy! Maybe Stephanie has taken up coaching a local puppy soccer team, which is unusual but an interesting idea. 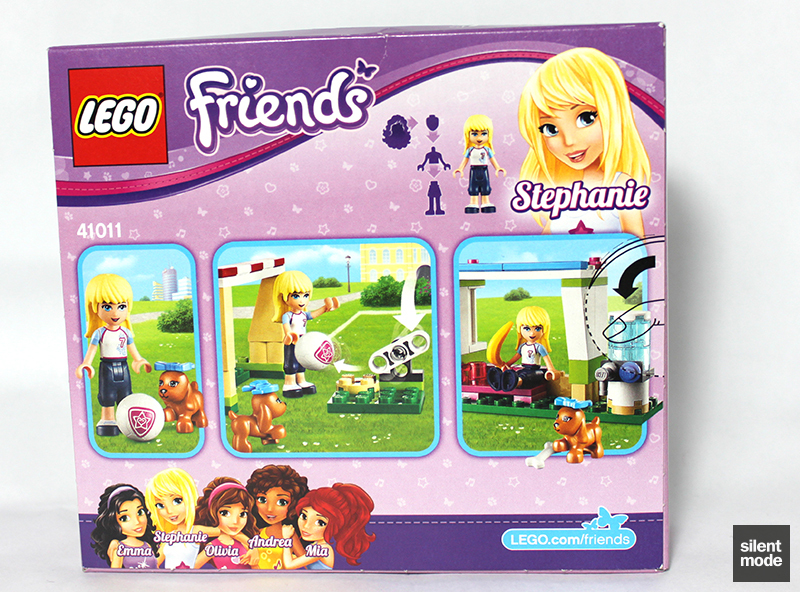 The pictures on the back of the box seem to confirm this idea: Stephanie is acting as both a coach and goalkeeper. I’m not convinced these shots are necessary, but I include them for completion. The only thing different with this set compared to the others is that the puppy is used for scale reference. We go back to the usual configuration of two bags, a large plate and the instructions when we open the box. There is something so pleasing about seeing a large Green plate, as opposed to a large White/Dark Bluish Grey/Black one. 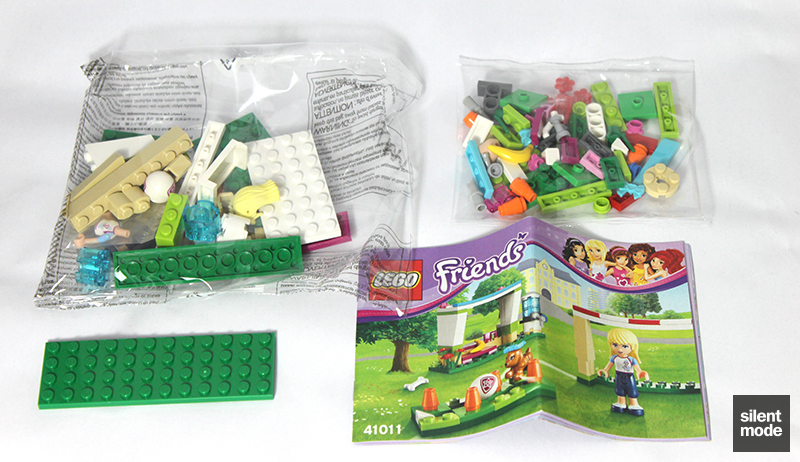 We can also see a variety of bright colours in the bags of parts, pretty much matching the design of the instructions. 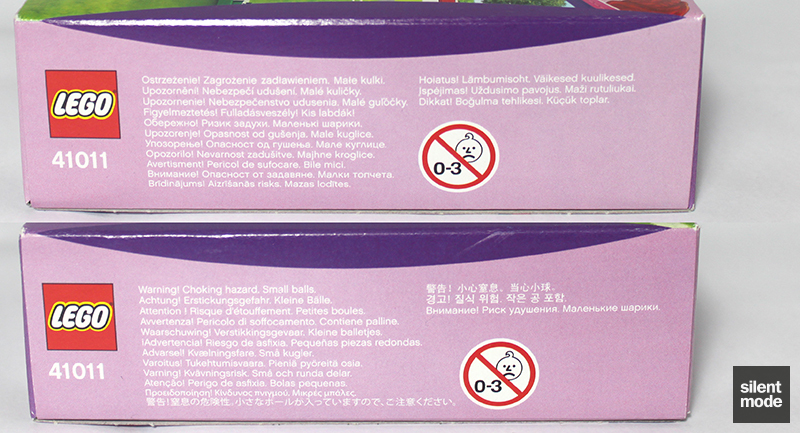 One of the main draws of this set is the return of the sports ball part, which I thought had gone completely. Previously available as a basketball and in various football designs, the ball in this set features a Magenta design: a triangular shape with a star and then a heart-shape inside. Probably representing the “Heartlake All Stars” or something cheesy. The design is duplicated on the other side. 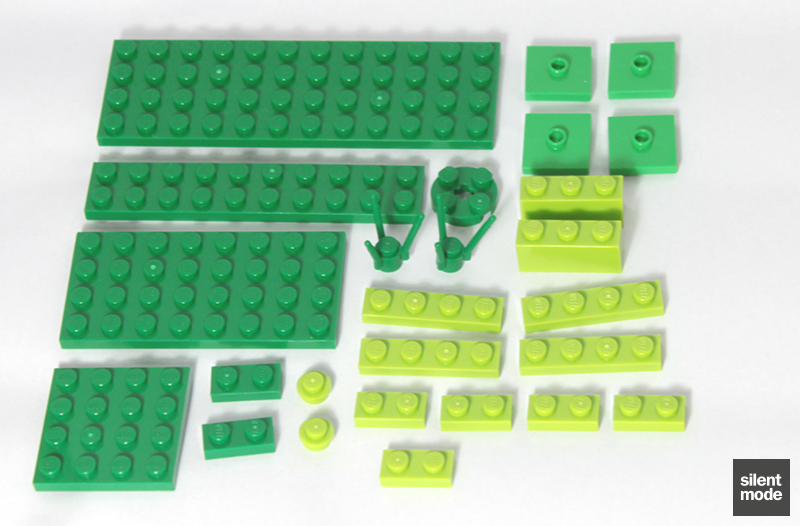 Virtually all the green parts in this set are plates, but there are quite a few of them, which is good. I particularly like the Green plates, but the Bright Green 2×2 jumper plates are great too. We’ve seen the Magenta 2×4 tile in Andrea’s Stage, and now this is the only other set you can get this tile in. The 1×2 tiles also appear in a number of other Friend sets. The Medium Azure tiles are exclusive to the Friends theme, and along with Mia’s Bedroom this is the least expensive method of accumulating them. If you like the Friends colours, or just tiles in general, you’ll want a lot of these! You’ll also remember seeing the Medium Azure bows in Squirrel’s Tree House. Finally the Orange cones caught my attention: although they appear in a small number of other sets, this part in this colour is fairly uncommon. Usually we see Red cones being used, so this makes a nice change. Also included in the set are four Tan palisade (“log”) bricks, in case you can’t get enough of those, as well as two Trans Light Blue round bricks and a small selection of plates. We also get one of those cool newer bracket pieces that was introduced last year, particularly with the Lord of the Rings theme. In the usual Friends tradition, the minidoll arrives separated into four parts. The puppy is eager to start training, so let’s put Stephanie together! So here we have Stephanie, making a triumphant return as a soccer (football) coach, in most likely an exclusive outfit. I will say that she looks the part, even with the same shoe design seen in Emma’s Splash Pool, and you’ll also notice the prominence of Dark Blue again. Otherwise, it’s same old Stephanie. 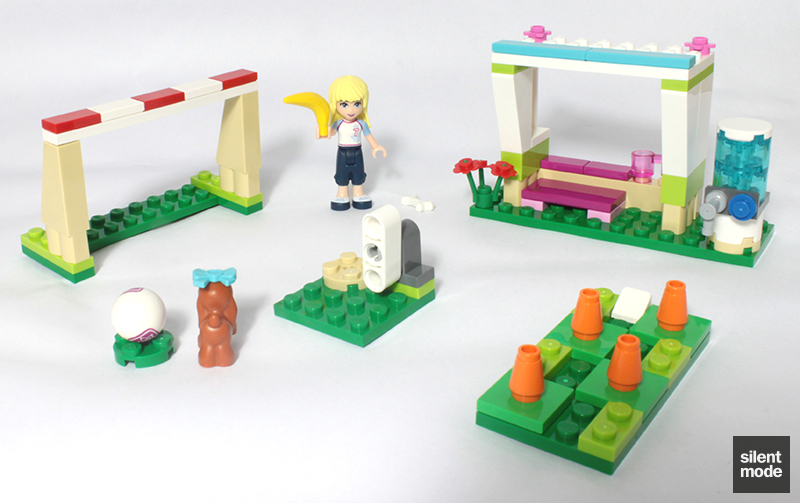 Get ready for something different with Stephanie’s Soccer Practice… instead of the usual three builds, we have a grand total of five! This build sets things off, and begins with this configuration of plates and jumper plates. A White cheese slope indicates where the small course begins. Once the Orange cones are placed on top of the jumper plates, the fun can begin. Place the soccer ball at the beginning of the course (where the cheese slope is), then using your finger push the ball along until you reach the end. Congratulations, you’ve made it! While it looks very simple, it’s actually a very neat play feature. The jumper plates actually help to guide the ball into the spaces, making it look like the ball is moving in-between the cones. It’s a little short for my tastes, but as with just about every play feature it can be extended and improved upon. 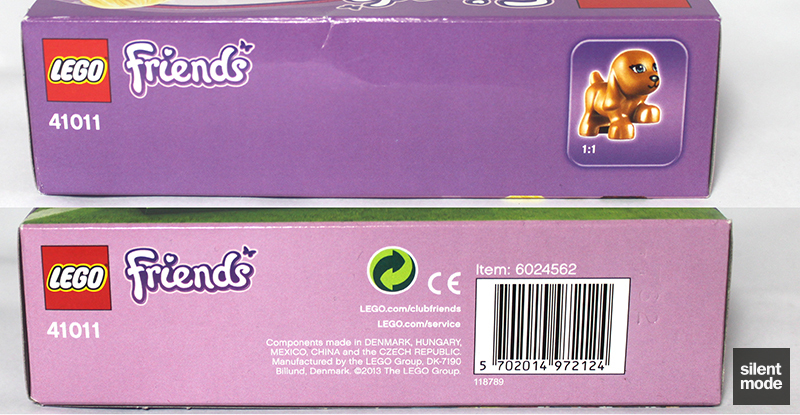 LEGO has also provided the round Green plate to sit the ball on when it’s not being used. This was a nice gesture, because you won’t believe how much that little ball likes to roll around. 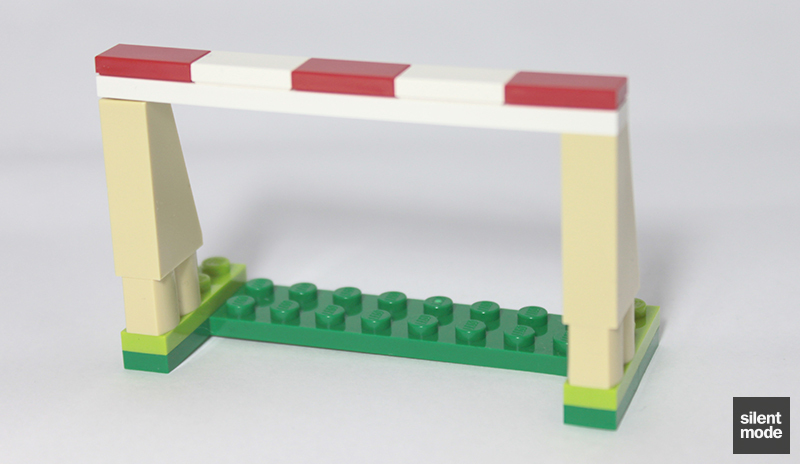 This is the foundation of the goalpost, made using Green and Lime plates. A useful technique for anyone to learn for creating unusually shaped bases. 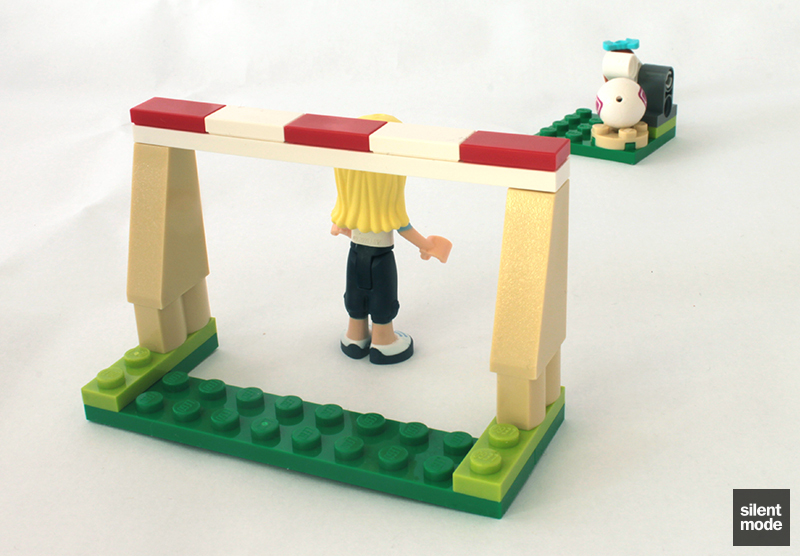 The rest of the goalpost is a simple design, as you can see here. 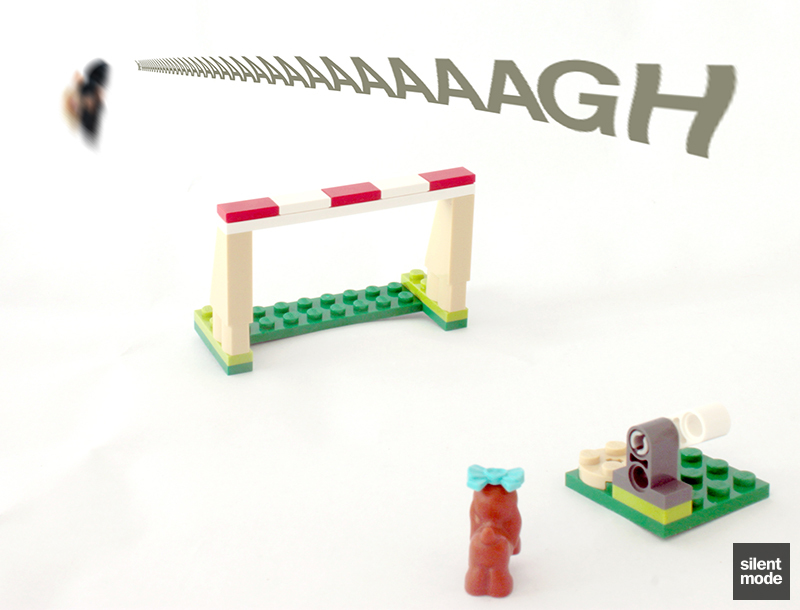 The Red and White tiles provided a very visible line showing the top of the goalpost: useful for aiming. Sadly the budget didn’t extend to providing a net, but they aren’t usually provided in public football fields. 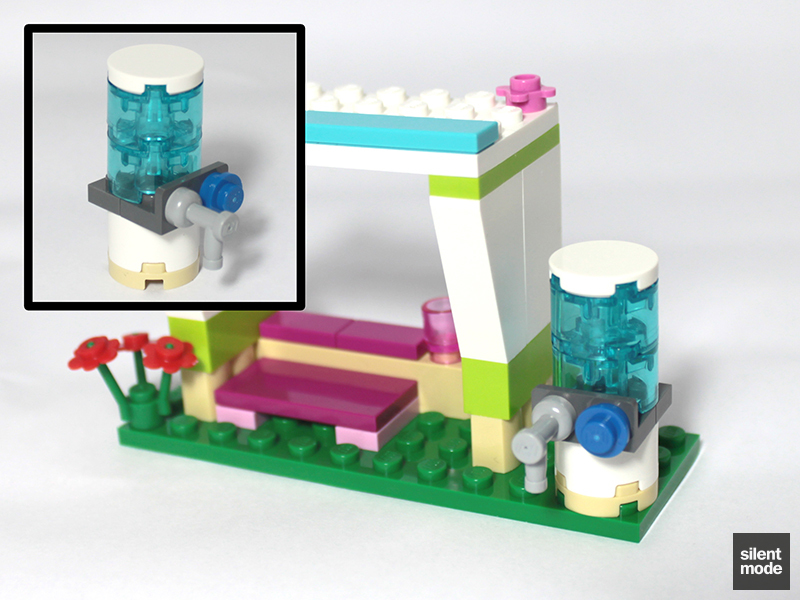 Six parts go into making this very simple yet somewhat effective ball launcher, which simulates kicking a ball. A very simple Technic technique is used for the arm (or foot, if you like), which kicks the ball – placed on the round Tan plate – when it is flicked the right way. 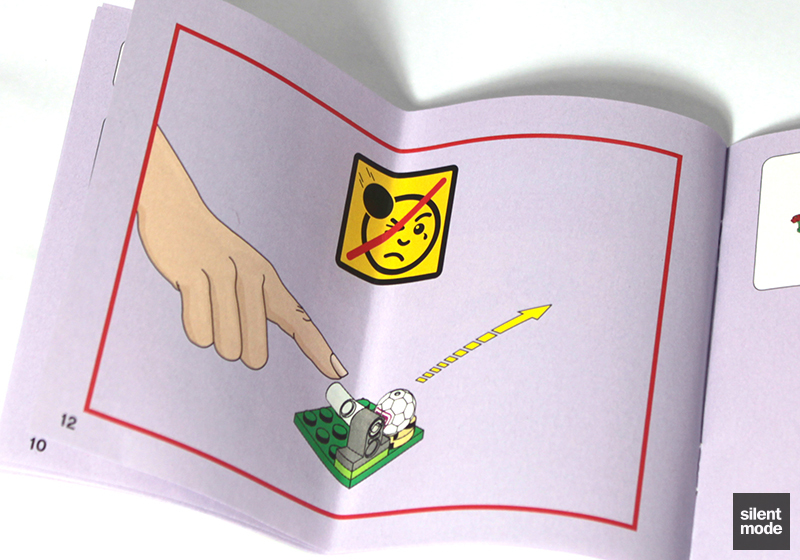 A short reminder from the folks at LEGO not to aim the launcher or the ball at the sun. The last Green plate serves as the foundation of the bench area. 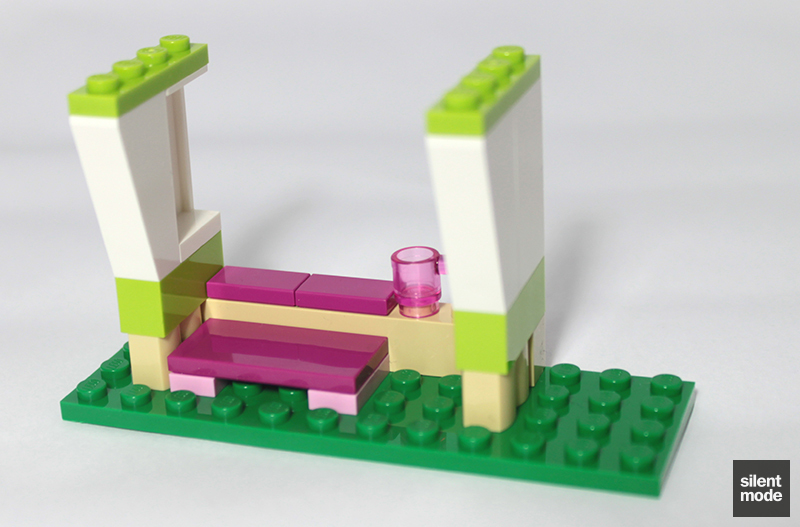 The Magenta tiles help to form a seat for the demanding coach, and there’s a suitable spot for their mug as well. 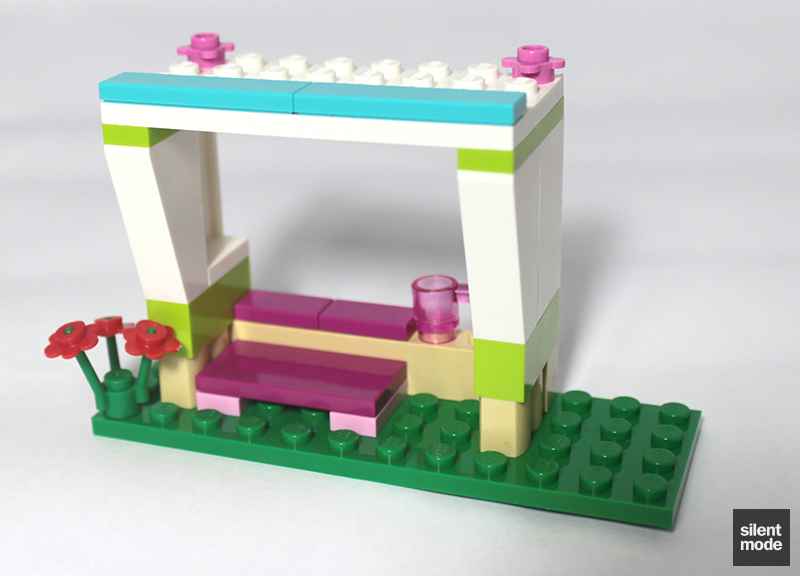 That’s something this set has in common with Andrea’s Stage: that beautiful 2×4 tile is reduced to being a seat! The walls of the bench area are formed using White parts, with a Lime trim. No sports training ground would be complete without a water cooler, or somewhere to get a drink from. This one is full of cold refreshing water, and we can almost turn the tap on and have water coming out. Without the newer bracket part, we probably would have used a couple of SNOT bricks (one stud on the side) to achieve a similar but blocky effect. So here we have it: five (technically four) builds in one relatively low-priced set. Isn’t it such an improvement on the comparatively minuscule Stephanie’s Pet Patrol? Stephanie looks far more at home training the puppy for the football team, than she does riding around on an overpowered quad bike. After all that building, we’re left with a generous but not incredibly useful selection of spare parts. It’s unfortunate we’re not given a spare Orange cone at least, and an extra football would have been nice (but maybe pushing it). One thing I like about this set was the choice of colours – particularly Green – and how the set looks somewhat realistic while retaining its identity as a Friends set. No large patches of Lime grass, and the balance of regular colours to Medium Azure and Magenta is about right. The cone obstacles were a nice touch, and a good example of how to add interactivity to a set without moving parts (except for the ball of course). Adding lots of jumper plates and tiles to a larger plate could potentially create a very simple maze to guide the ball around! The ball launcher is also a good play feature, if a little difficult to use for big fingers: I would have preferred the use of an L-shaped Technic arm, rather than the straight arm, to make it easier to launch the ball. Try as I might, I wasn’t able to launch the ball hard enough that I could have injured someone. It was fun to try, however, and that particular play feature will provide at least some entertainment for the kids. I’m not sure about the inclusion of this particular puppy, but anything would be better than that darned kitten. That’s probably the only thing I “dislike” about this set. Props definitely go towards the set's colour scheme: yes it's a Friends set but that doesn't mean it has to be blatantly girly. This set was definitely designed around interaction. Everything was simple and quick to build, posing no problems whatsoever. The ball launcher could be improved with perhaps one part change. As well as the [assumed] exclusive minidoll outfit and the football, the tiles and Orange cones are worth looking out for. The other pieces may be worth keeping for MOCs. I'd give an 8.5 if I could... There are enough features to make this a playable set, but you can have a scoring competition with a friend or combine two sets to make a football game! 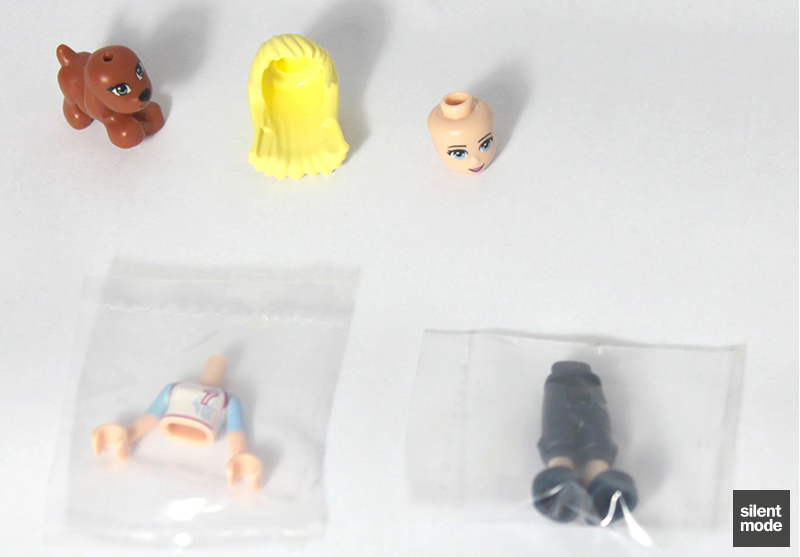 Again torn between a 7 and an 8, this set is all right for the price: worth getting at RRP for minidoll completion and the football; consider getting for parts when discounted. Based on these scores, Stephanie finally meets my approval with a 7.8/10. Congratulations Stephanie! But you know what, I’m still going to get her.